Link Divestment to Community Choice? The last several months has witnessed an intensified opposition in the Bay Area to fossil fuel expansion: from the growing fight against Obama’s Keystone Pipeline, to the building of a statewide campaign to ban oil fracking in California, to the divestment of Big Oil stocks by public institutions in the Bay Area. These fights against the fossil fool industry has highlighted the alternative, specifically the development of local clean energy resources. And since the alternative to fossil fuel-based electricity requires massive investment in new infrastructure, what better way to finance this investment than through the divestment of fossil fuel holdings? For example, a robust Community Choice program in San Francisco to build local renewable energy assets calls for about $1 billion of financing over the next ten years. The divestment of fossil fuel holdings by the San Francisco Employee Retirement System ($583 million) could provide half that amount. 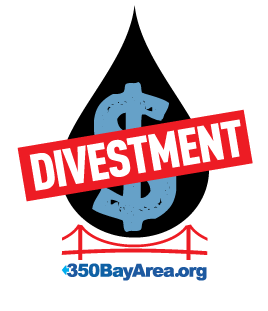 So efforts to establish Community Choice energy in San Francisco, Sonoma County, and in the East Bay—all of which have been moving forward this spring—have a natural ally in the divestment movement. To keep informed about these developments, be sure to subscribe to Local Clean Energy News and Alerts. We confront the socio-economic challenges of climate instability by empowering communities to organize for their basic human rights through flexible tools, models, and policies that strengthen their communities. We commit to uplift the voices and leadership of youth, low-income communities, communities of color, and indigenous communities. The time is now! Grassroots leaders like you are the key to neighborhoods thriving through economic downturn and climate change. Rooted in Resilience shows you how with the Community Resilience Toolkit and workshops. Become a community leader for resilience! How much food, water, and energy can your city provide locally, in ways that are good for people and the planet? Join a Green Your City campaign and find out. Rooted in Resilience promotes practical models for greater self-sufficiency, and policies that bring them to scale. Rooted in Resilience hosts the Local Clean Energy Alliance, unifying over 90 Bay Area organizations and businesses to work toward a single vision: let’s stop wasting energy, clean up our air, and put people to work! Join the Alliance today. Rooted in Resilience is a project of Earth Island Institute. © 2007–2019 Rooted in Resilience.